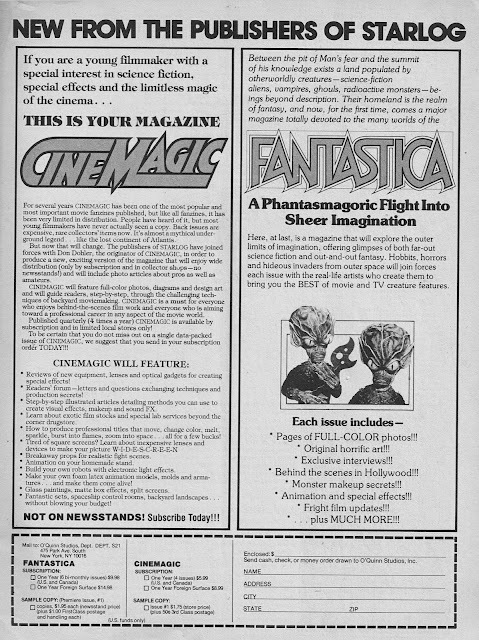 From 1978: two more early editions to the growing line-up of STARLOG GROUP spin-offs... the acquisition of special-effects-how-to guide CINEMAGIC and chuck-in-a-bit-of-everything Starlog spin-off FANTASTICA. Fantastica? Err... yup. Before FANGORIA became a gore-soaked blood bath of a horror mag (and a successful franchise in its own right) it was a muddle of horror, SF, fantasy and almost anything else the publisher decided to include. 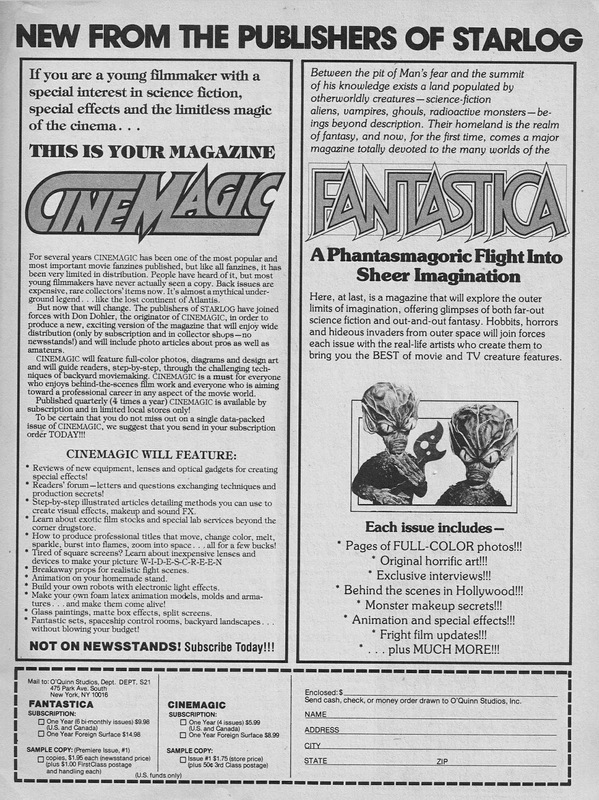 And before it was called FANGORIA, it was promoted as Fantastica. 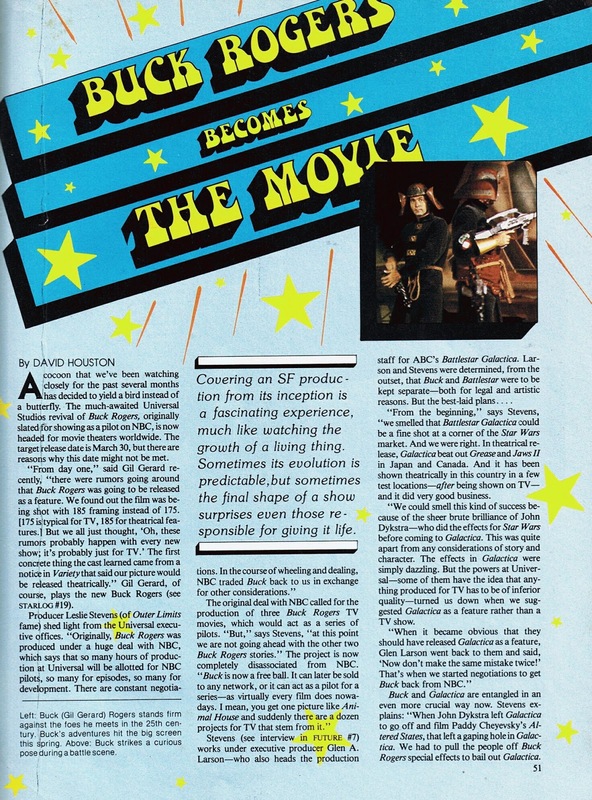 Starlog, which didn't always have the best of luck with naming new launches (see also: COMICS SCENE) then promptly found themselves being sued by the publisher of FANTASTIC FILMS, who claimed readers would be confused. 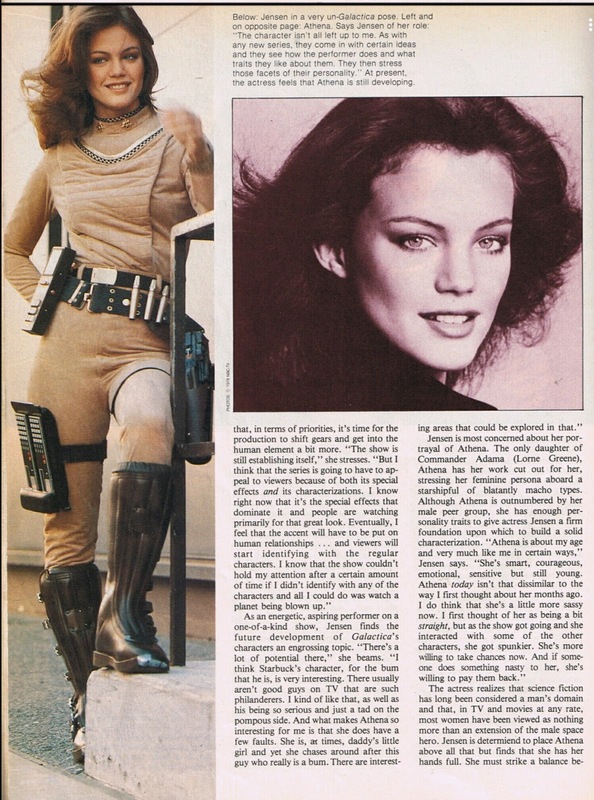 Starlog paused... and rebooted as Fangoria. Only to find no-one was buying. The fantasy theme of the early issues left readers cold... but there was a response to the horror elements. So, from issue 7, the emphasis shifted and a legend was (re)born. 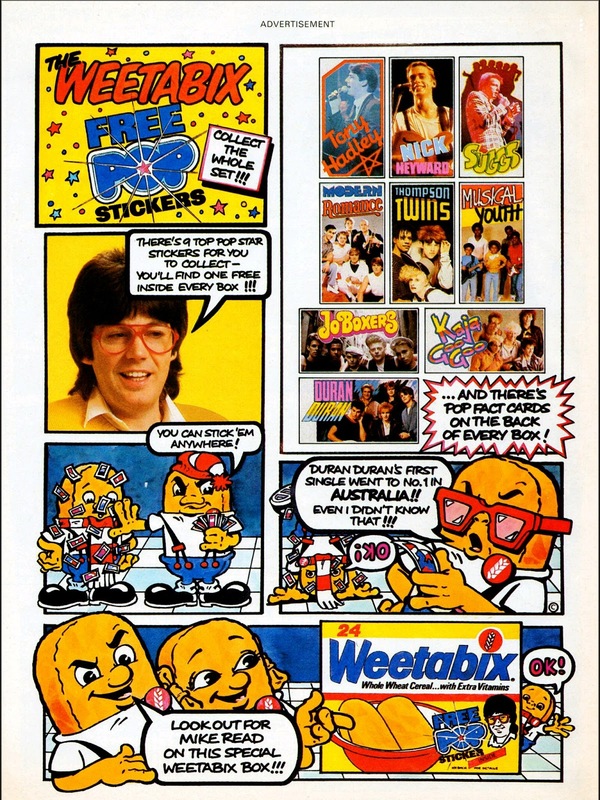 From 1983: crispy-or-stodgy British breakfast mainstay WEETABIX (once the home of DOCTOR WHO, STAR TREK, FLASH GORDON and DC SUPERHEROES) tries to up its cool quota (by channel non-threatening Radio 1 DJ and all-round BBC go-to guy Mike Reid, who no-doubt made a few quid off this one) and giving away some pop-tastic stickers in special packs. The advert appeared in EAGLE. 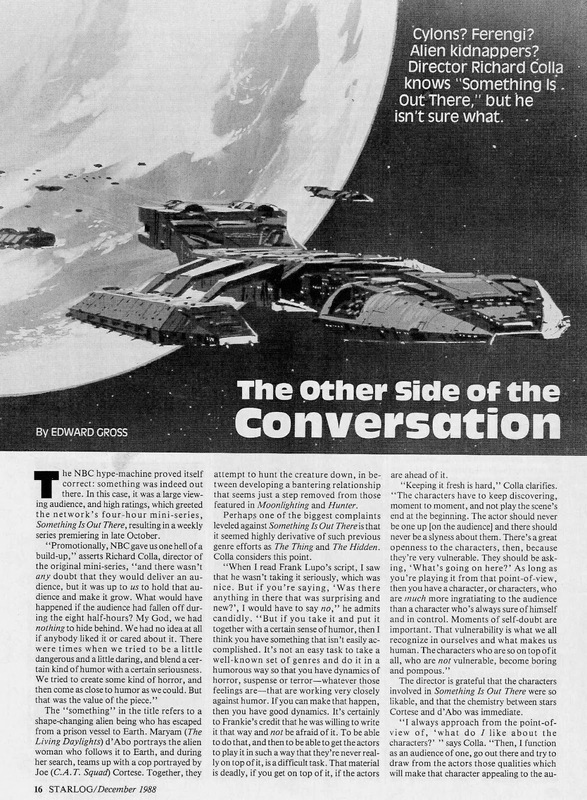 1988: BATTLESTAR GALACTICA DIRECTOR RICHARD A. COLLA TALKS TO STARLOG MAGAZINE... BUT DOESN'T MENTION GETTING SACKED! From 1988: TV veteran Richard A. Colla discusses his life in SF TV with STARLOG MAGAZINE... including his stint directing (most of) the BATTLESTAR GALACTICA pilot episode (and faux feature film) SAGA OF A STAR WORLD. 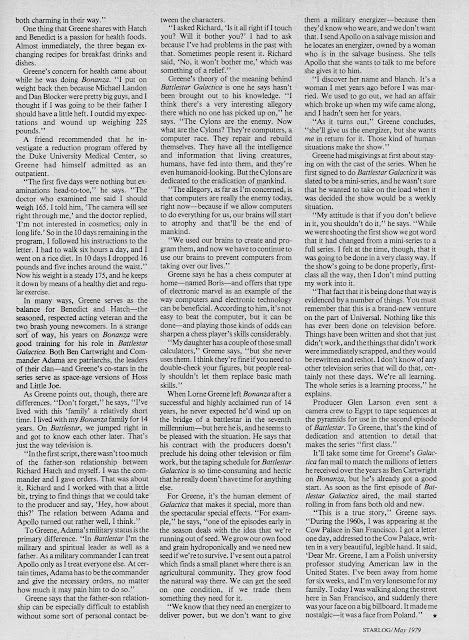 A quick re-read of the interview is interesting.... 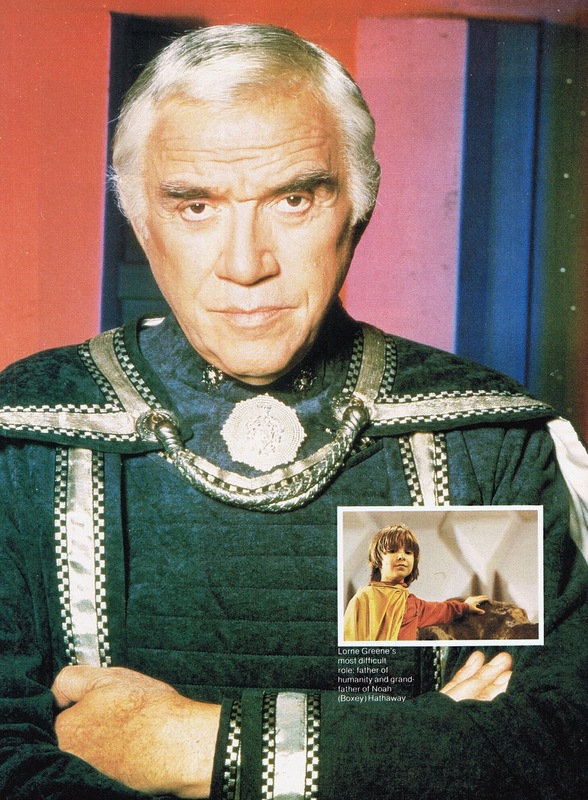 He doesn't seem to mention that he had an almighty bust-up with Glen Larson during the shooting of Saga and was fired from the project before principal photography was completed. According to other accounts, there was only four days left on the schedule when he was replaced. 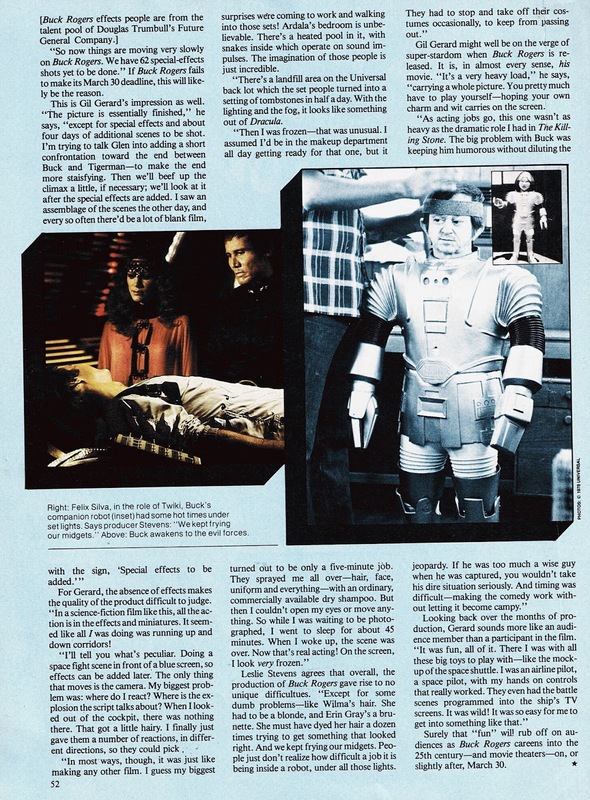 His uncredited successor was another small-screen trooper Alan J. Levi. 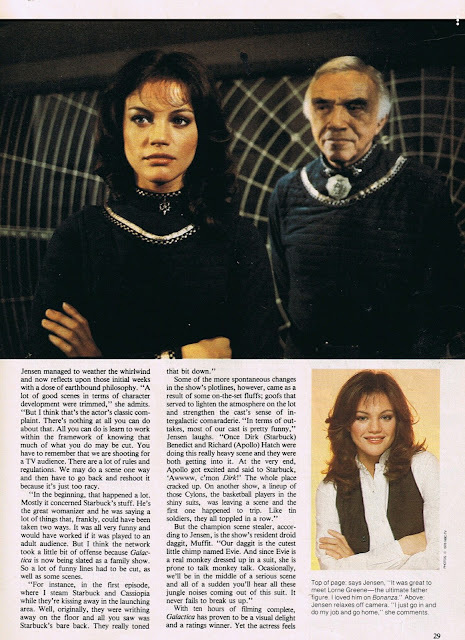 Larson had already booked him to deliver the next story to shoot, the two-part Hoth alike (but shot more than six months before filming started on EMPIRE) GUN ON ICE PLANET ZERO. Levi was dragged in early to pick up where Colla was forced to leave off. The reason for the sacking? Colla claims Larson was interferring too much with the filming and a succession of minor disagreements eventually escalated into his dismissal. I'm sure Iove seen Larson claim he has let go because the shoot was too far behind schedule and costing too much. I suspect both are probably close to the truth. The sheer amount of shot-but-never-used footage for the opener (see the DVD and BR releases) is a sure sign that, behnd-the-scenes, the decision-making process was a little murkey. 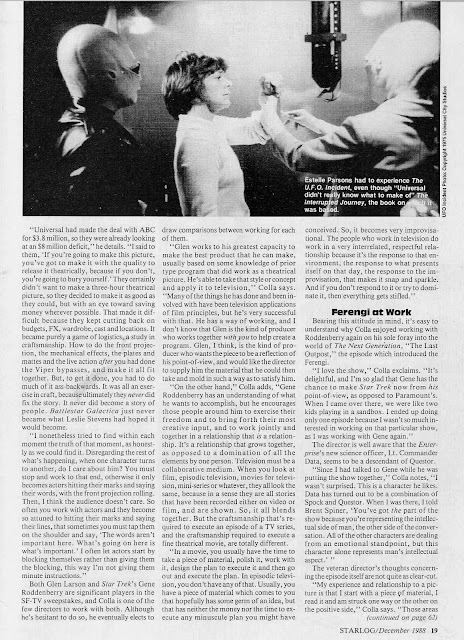 Trivia of the day: Directing TV pilots can be a lucrative business. If the show sells and goes to series, the original director continues to recieve a per-episode payment for establishing the initial look-and-feel of the show (including key elements like casting, costume etc). So, even if the director is never invited back (or doesn't want to go back), they'll continue to profit from the success. From the summer of 1984: the ubiquitous MIDLAND BANK sign-up-the-kids-and-we'll-have-em-for-life GRIFFIN SAVERS 'starter kit', as advertised in the pages of EAGLE. - A long-gone from the High Street brand name. - A cunning way of making a staid-and-stuffy brand identity look more - ahem - human. - An ace marketing slogan that's outlived the bank itself in the public conscious. Beat that HSBC UK! 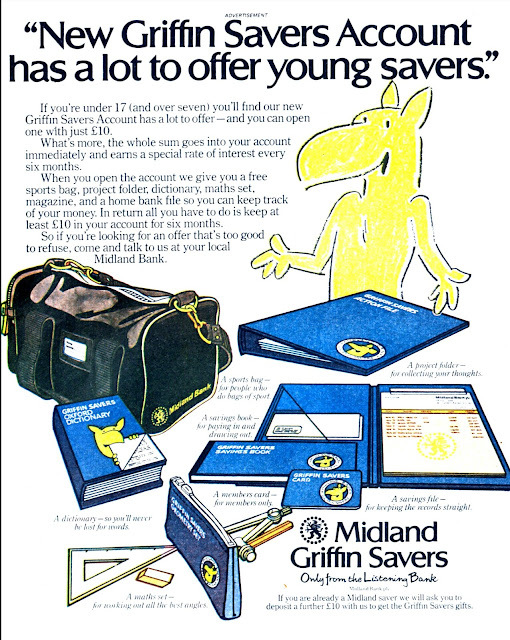 - A school bag that everyone seemed to have... especially if you had parents who saw the value in savings AND saving money. As the term went on, sightings would become rarer as the good-but-not-great quality succumbed to daily wear-and-tear. - A dictionary which was likely to be defaced on the first day of term... and almost certainly didn't have any rude words in (the ones that did were always deemed to be THE BEST dictionary). - A stationery set once again pitched at the price-sensitive parent. With a compass ideal for unexpected attacks on classmates during a dull GCSE English Lit. class. How many people have actually ever used one - for anything - since they left school? Except - maybe - for pipe fitters and circular hole makers. It's bonkers to think that this was a time before Poundland and free stationery kits as comics freebies when such a set would actually represent a considerable start-of-term investment. - A folder. Because everyone knows that a folder is a great starting point for any project. From 1988: A classic 'twenty minutes until home time and I need to fill half-a-page' house ad showing the beleaguered state of the Fleetway boys' adventure line-up. 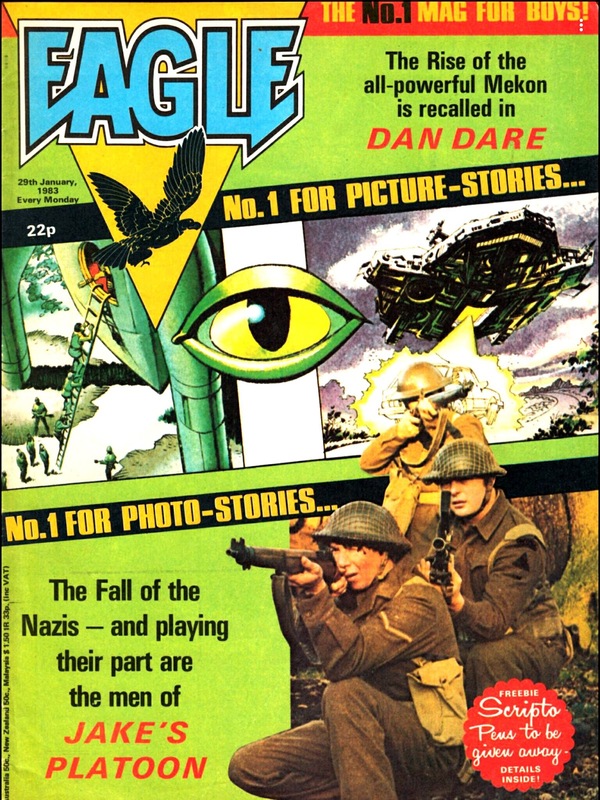 EAGLE had just gobbled-up BATTLE (the latest in a long list of conquests), MASK was a toy/ TV tie-in with a finite lifespan (I wonder where that ended up....?) 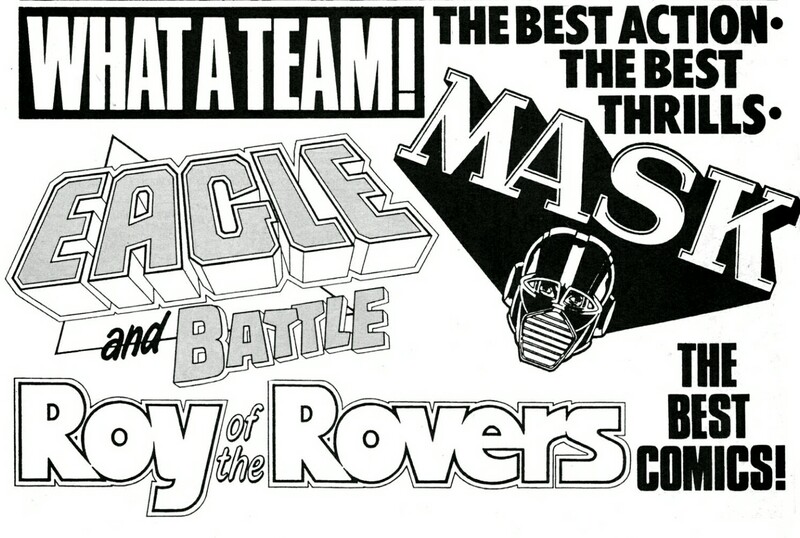 and ROY OF THE ROVERS was the sort of comic read by people that didn't look at the other titles. And visa versa. Interesting to note that 2000AD wasn't seen as part of the line-up. From 1988: Actor Duncan Regehr discusses his brief stint on V; THE SERIES (four episodes, a wedding and a murder), the movie MONSTER SQUAD, the blink-and-you-missed-it fantasy show WIZARDS AND WARRIORS and the even more fleeting EARTH*STAR VOYAGER. 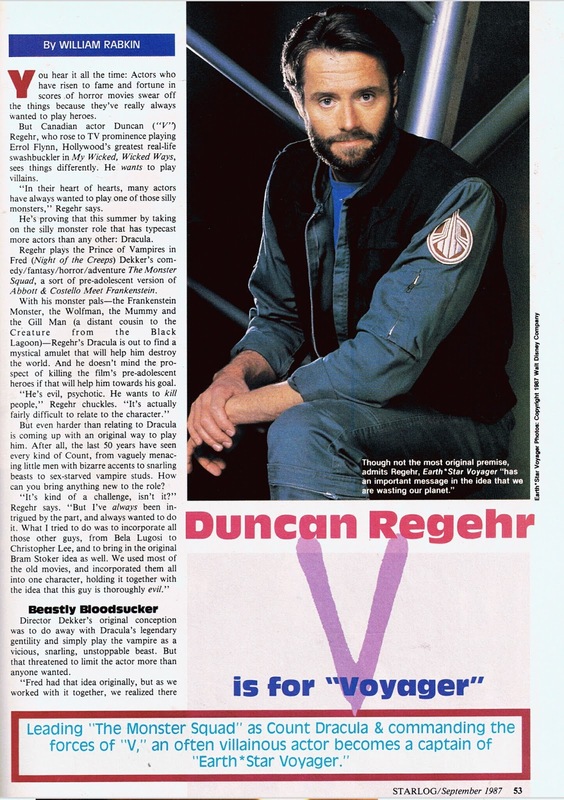 His four weeks on V:THE SERIES, playing the charismatic Charles, was one of the highlights of the erratic series and came mid-run, just as the show was transitioning from the A-TEAM/ Soap hybrid of the early episodes (something akin to the successful format of the two mini-series, especially THE FINAL BATTLE) into the bargain-basement campery of the show's final months on the air. 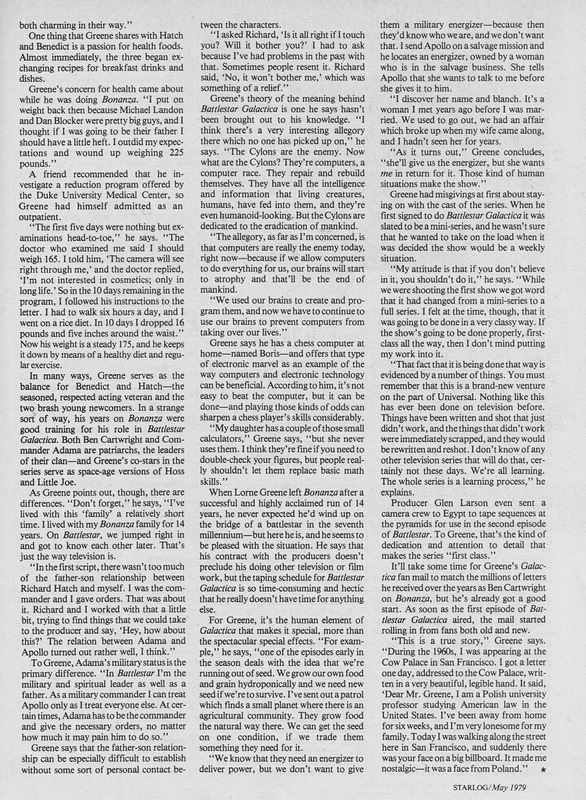 What I find interesting in this interview, and it is something that does not appear to have been picked up elsewhere, is that the twin-brother-with-the-same-fake-face plotline, eventually given to Frank Ashmore all but reprising his role as Martin from the mini-series and first hour of the weekly series, was originally devised to allow Regehr to step back into the show. 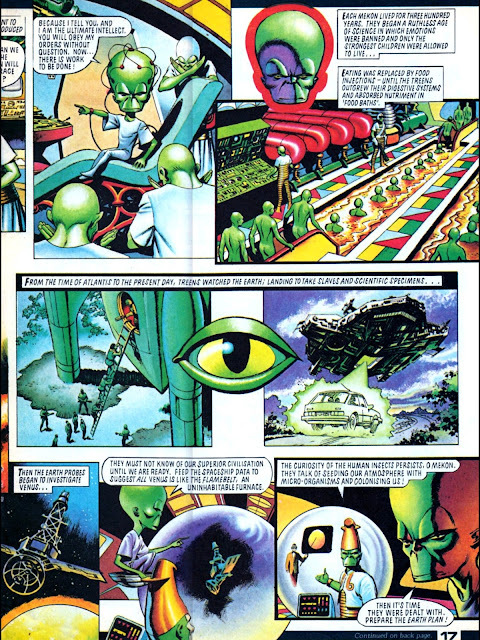 It would have been a lot more interesting to have seen 'Charles II' as the traitor in the midst of the alien ranks. Regehr was one of those prolific actors of the period who never quite became a star. Maybe it was a succession of poor choices (none of his TV work seemed to go very far for very long) or because he seldom seems to look like the same person in any two productions. I still find it hard to spot him... even when i know the character he is playing. The interview is from STARLOG MAGAZINE. 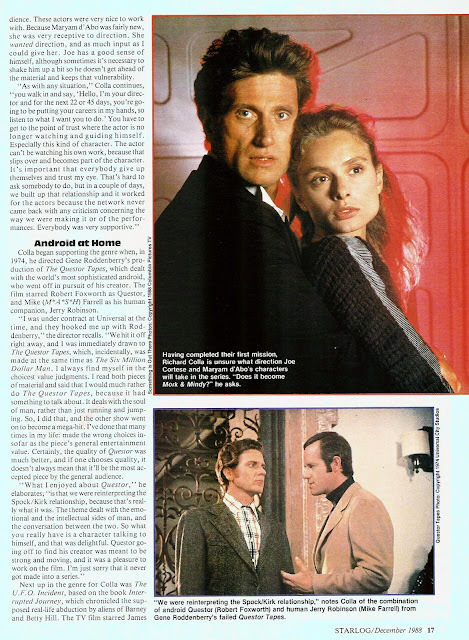 From the VHS era: another of the tapes in the Universal/ Sci-Fi Channel tie-up which presented a range of found-on-the-channel shows packaged in the same style. 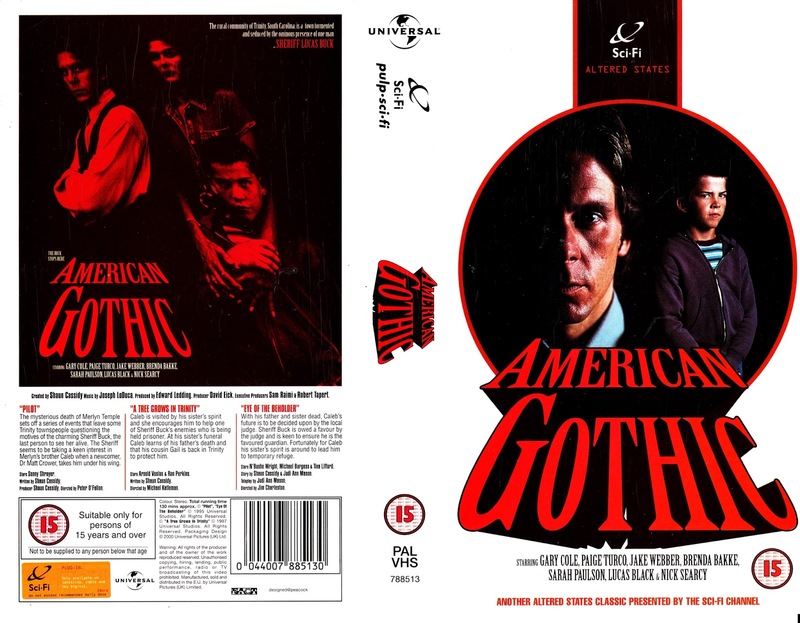 Unlike some of the other shows included in the collection (BUCK ROGERS IN THE 25TH CENTURY, BATTLESTAR GALACTICA, SLIDERS and others), this was the only tape release of AMERICAN GOTHIC in the UK. Who knew that we were only a few years away from DVD and the chance to own the whole of this one-season-wonder. I really liked this show back-in-the-day. I thought the premise - and the performances, writing and direction - were genuinely innovative and not just another one of the jumping-on-the-supernatural-bandwagon shows that cluttered the airwaves at the time. 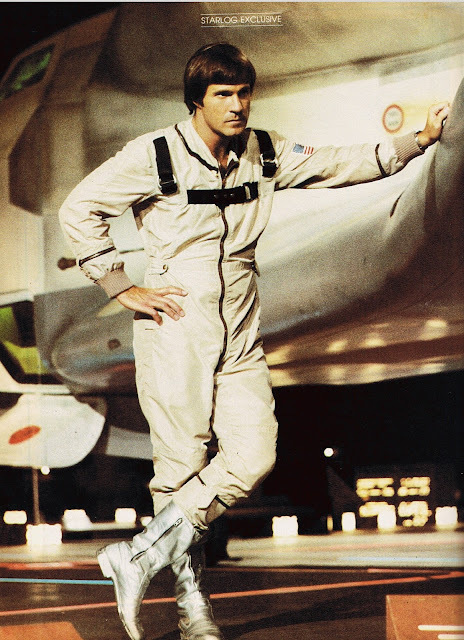 Clearly the dead hand of a nervous CBS buggered things up a bit (messing with the TX order so it didn't always make much sense, casting changes to try and draw in more viewers and some dumb-but-promotable 'stunt' episodes) but the creative vision remained largely intact. 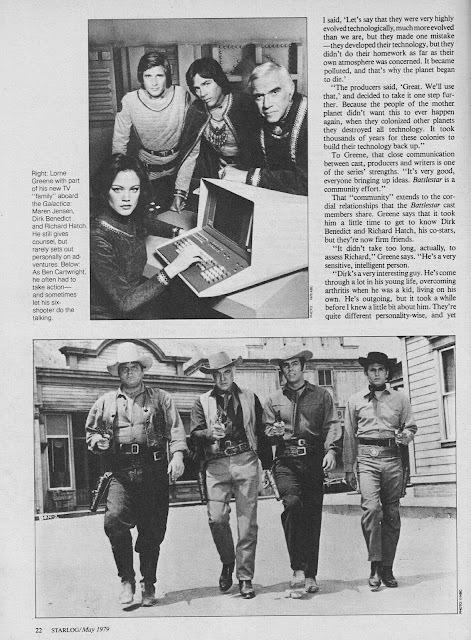 Like EZ STREETS (another CBS show that sadly went nowhere very fast), it was clearly a made-for-cable (or the new century) show tryig hard to survive in a traditional network environment. It didn't help that it wasn't pitched at the traditionally older and rural (hello MURDER, SHE WROTE) CBS audience who weren't likely to tune into a sheriff-is-the-devil show in any great numbers. 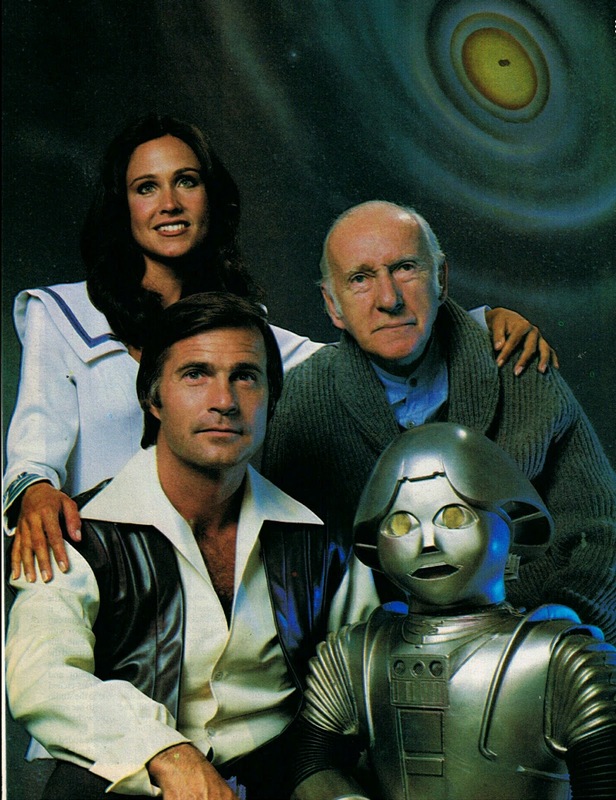 The series aired on CHANNEL FOUR here in the UK with later repeats on - of course - The Sci-Fi Channel. It has been available on DVD for years and is well worth watching. From February 1983: More gold-badge start-of-year gifting, this time from BUSTER. Once again, IPC's freebies team went back to their go-to people for gold giveaways (see also: EAGLE issue 2 and 2000AD 300) to create this uncanny likeness of the onetime 'son of Andy Capp'. 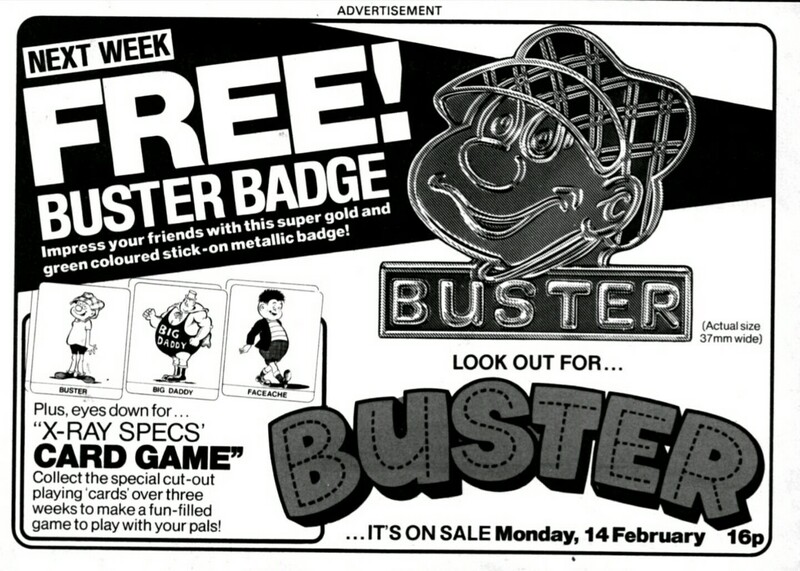 Clearly the booklet people were already rushed off their feet with other punter-retaining projects but - not to be left out - the Buster gang concocted a game which, it seems, you ad to wait three weeks before you could start playing. I hope it was worth the wait! 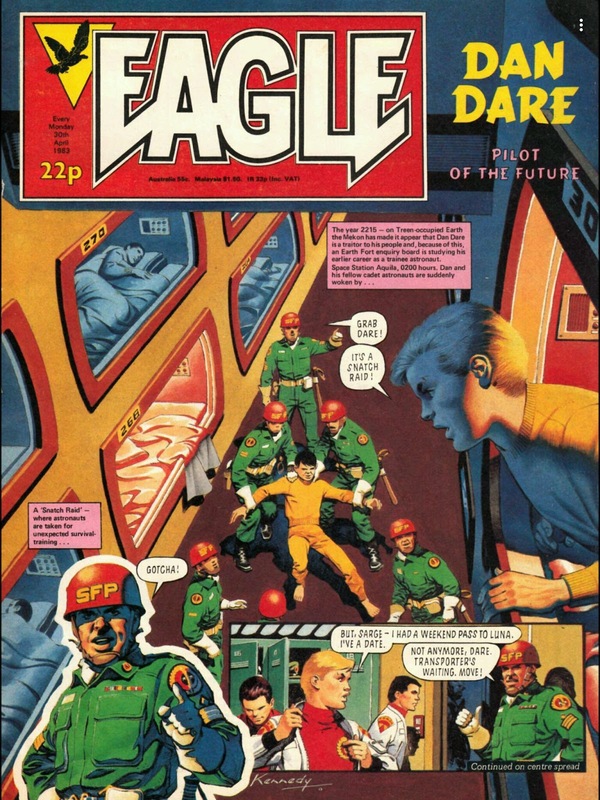 On sale thiis week back in 1983: EAGLE issue 58, cover-dated 30 April (remember: the date on the cover represented the 'off-sale' date rather than the day the comic hit newsagents). 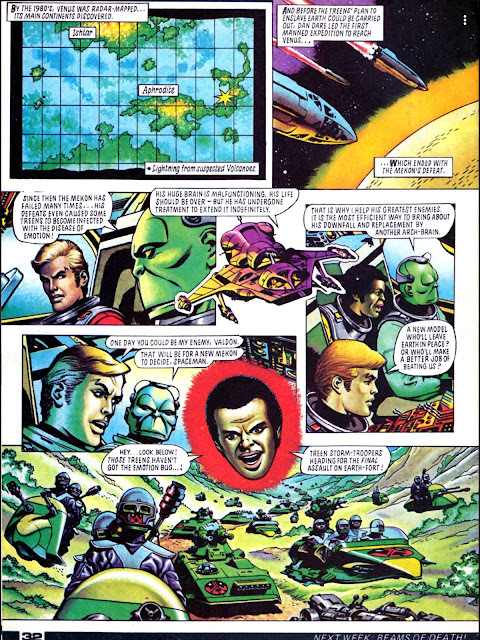 By this point, the DAN DARE strip had regained its traditional starts-on-the-cover status, officially maintaining the three-pages-a-week count. I always considered this to be a bit of a con (and not just because it saved the time, trouble and expense of designing a decent cover each week) as the cover splash demanded strong, bold visuals which - although eyecatching - often didn't add much to the overall story. Effectively an expanded panel subbing for what would have been a full page of traditionally structured art under the previous layout. I suspect deadlines and weekly churn played their part and the art remained top-notch throughout. There was just a need to deliver less panels per week. Although, look at the detail in that first panel... lovely stuff. 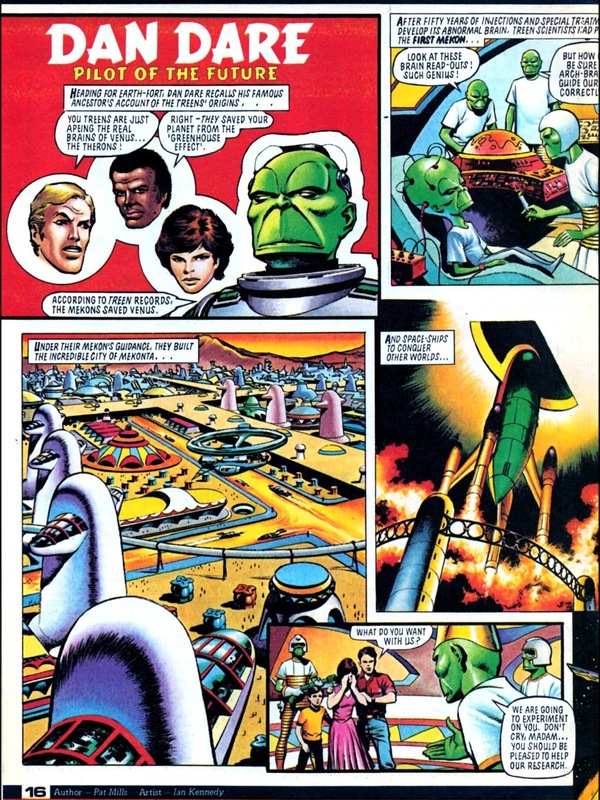 The Dare strip had - at this point - drifted away from the core Return of the Mekon storyline into an extended astronauts-in-training flashback which couldn't hope to measure up to the Mekon and Earth occupied by the Treens. But it was still a lot better than some of the dross - and reboots - that would follow over the next decade. But, just like the whole photostory era in general, there is still innovation to be found. Check out the successful inclusion of well made (and well lit) model work into the art! Another benefit (soon to be lost) of the superior printing used during the early run. I wonder if the editors of the other weeklies looked on enviously... or whether they were thankful their titles weren't carrying the additional overheads. From February 1983: New year... new freebies! IPC's circulation gurus obviously thought that the first months of the year was a good time to perk up their weeklies with a few freebies.... I've found several adverts for cool covermounted goodies from this part of the year. 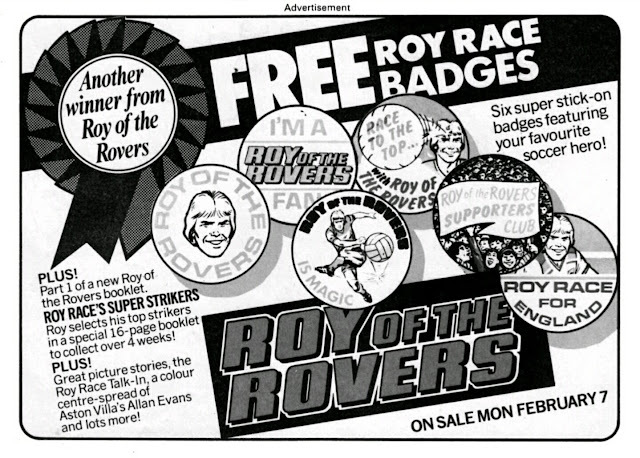 Here's ROY OF THE ROVERS trying to tempt fans with a set of 'stick-on' badges (hmm... sounds a bit like 'a set of stickers' or 'one badge... and some stickers to stick on it').These days they'd have to give away six badges, a sheet of stickers and a pencil box. All attached to the same issue. And - oh look - the launch of yet another clip-and-collect keep 'em comic back booklet. 'Race to the top' indeed. From 1994: the first of the CLASSIC STAR WARS trade paperbacks, published in the UK by Boxtree (the masters of flooding the market with quick-and-dirty reprints). 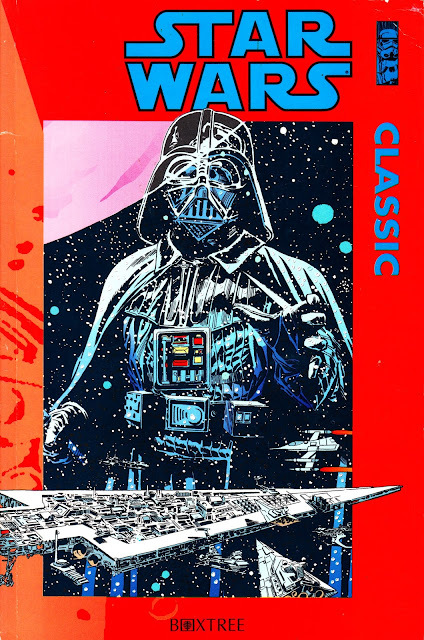 IDW is about to publish a classy compilation volume of the STAR WARS NEWSPAPER STRIPS... so Marvel NY beat them to market by issuing their own trade paperback compilation of the old Dark Horse series from the early Nineties... which (heavily) reworked the US newspaper strips (which i don't think ever had an outing on this side of the Atlantic) into comic book format. The strips - both original and reworked versions - have, until this year, languished untouched for several decades. But the return of the movie series, and Marvel's energised publishing programme, has obviously renewed interest. The new Marvel book is a curious mix of some of the pages reworked by DH and some - previously unpublished - strips in their original 'newspaper' format. I'm assuming the IDW effort will preserve the strips as they were originally intended/ published. Let the comparisons begin. Boxtree published three volumes (that I know of) of the DM monthly series way-back-when. 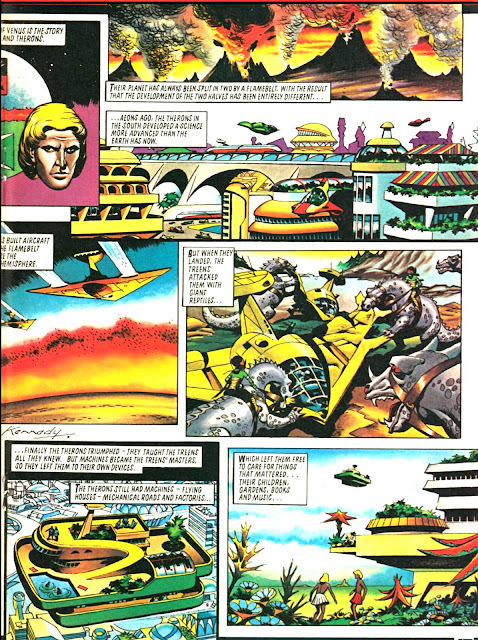 Some of the strips also appeared in the short-lived Dark Horse International published UK monthly. Which shuttered after less than a year. 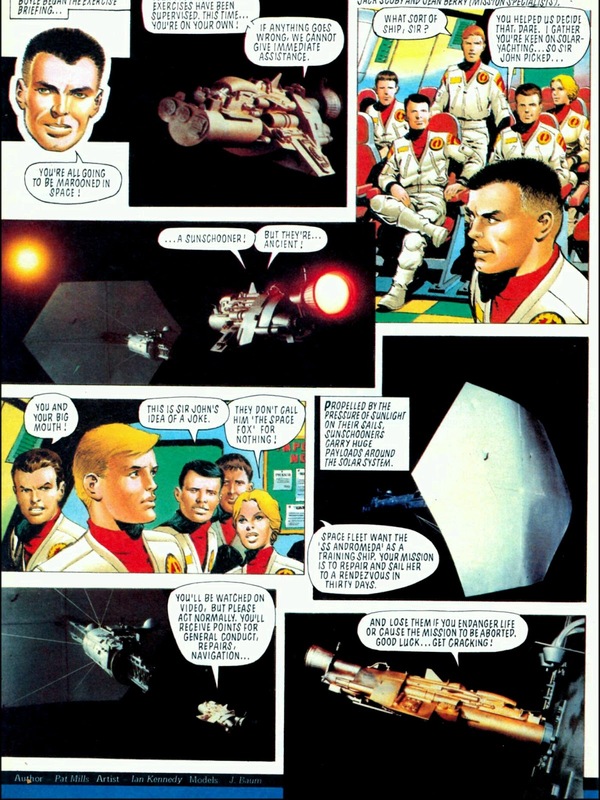 The strips also appeared in the earliest issues of the US magazine AMAZING HEROES. 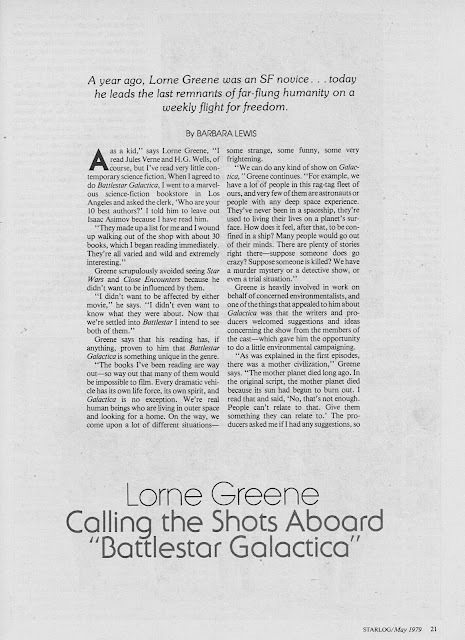 From 1979: STARLOG MAGAZINE maganges to stretch out (mostly by interviewing his parents) a very brief interview with BATTLESTAR GALACTICA's Noah Hathaway into a full-page companion to the Lorne Greene piece. 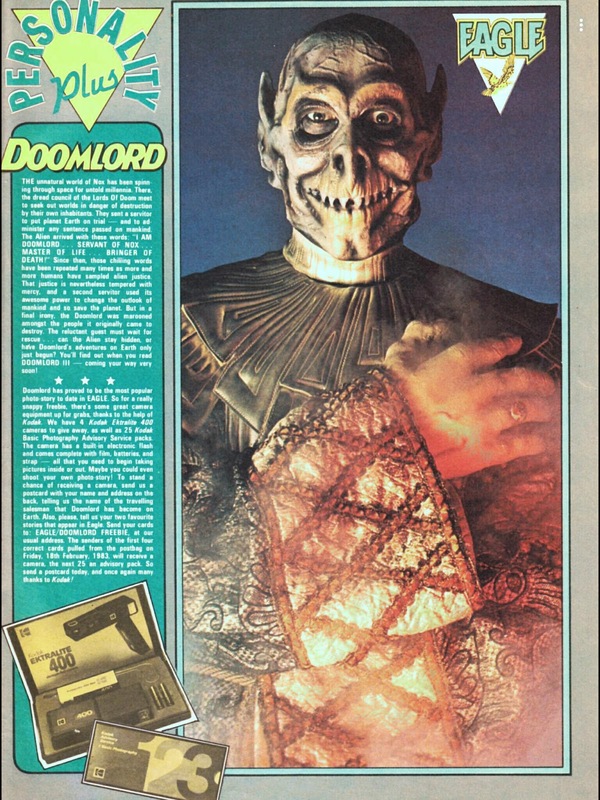 From 1983: DOOMLORD (self-confessed 'Master of life, bringer of death') gets the PERSONALITY PLUS treatment in the EAGLE. Maybe they were short of celebs... or maybe they just wanted to show off - in colour - the excellent mask (apparently an off-the-shelf shopping trip find) and costume. From 1979: Another STARLOG MAGAZINE teaser for BUCK ROGERS IN THE 25TH CENTURY. At this point, it had ceased to be a TV project (it was initially shot as the first of three teleflicks for NBC) and had morphed into a fully-fledged feature film. And then, when the box office ticked the boxes, it landed back at NBC as a series. 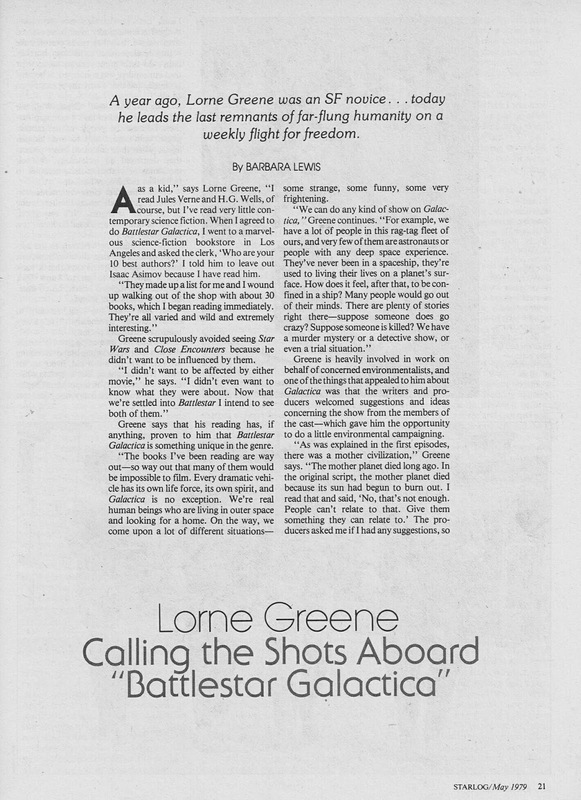 From May 1979: Lorne Greene discusses BATTLESTAR GALACTICA with STARLOG MAGAZINE. From 1983: a UK advert for the Airfix STAR WARS: RETURN OF THE JEDI model kits. 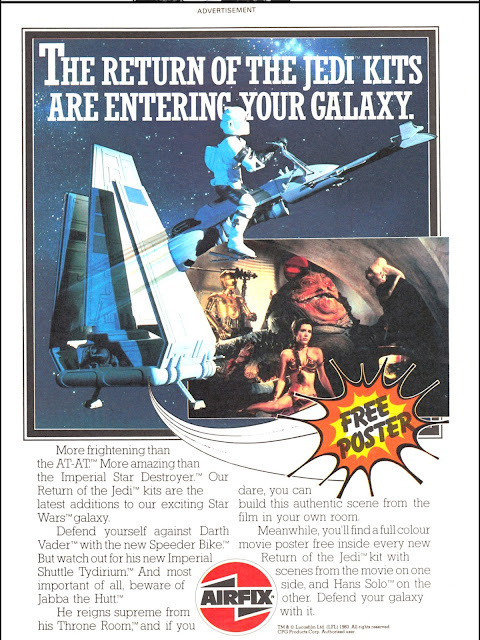 With free poster offer... and the Marketing department were very smart in their selection of stills to adorn young boy's bedrooms across the land. Those sticky fingers weren't just because of the glue don't-you-know. From 1983: Remember MANIX, the SIX MILLION DOLLER MAN knock-off from EAGLE? Ever wondered what he looked like in his pants? Here's a fun piece of pre-Photoshop design work which really shows how innovative the much maligned photo-strip era of the new EAGLE could be when the boffins in King's Reach Tower put their mind to it. 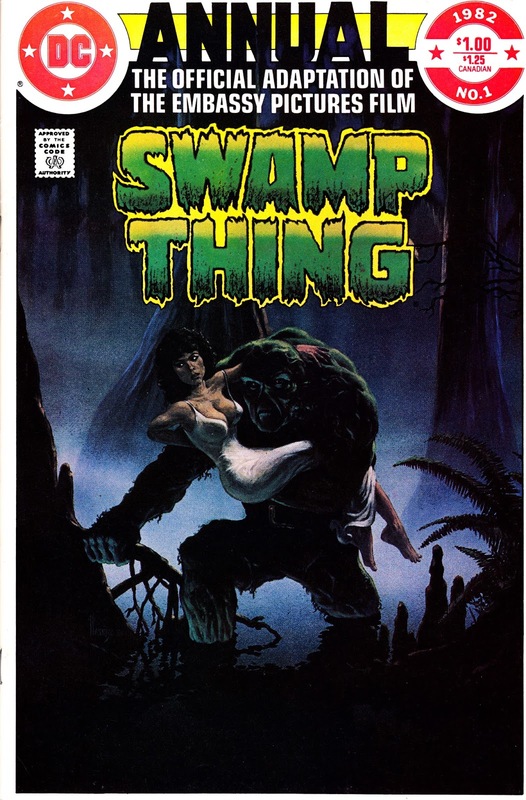 From 1982: the first US SWAMP THING ANNUAL, actually an adaptation of the slightly-campy cult classic man-in-a-rubber-suit movie. 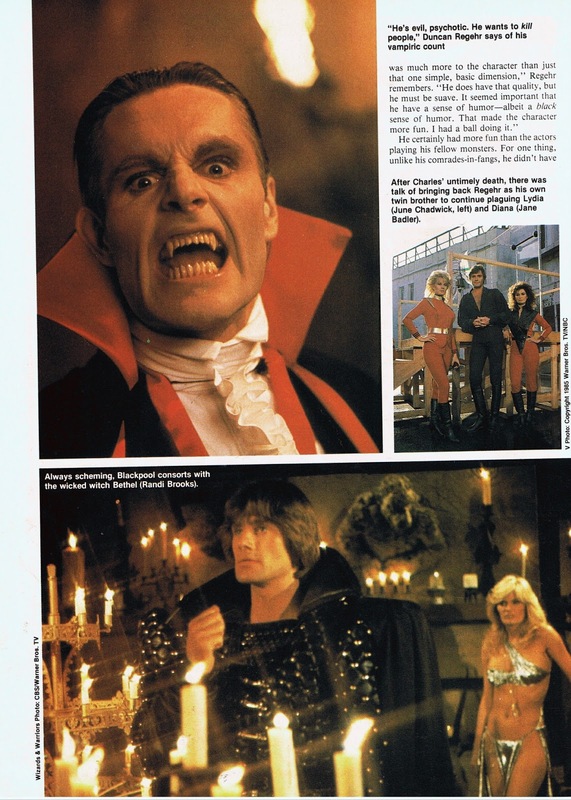 It's hard to believe this minor entry on Wes Craven's credit list, starring the lovely Adrienne Barbeau (career highpoints: THE CANNONBALL RUN, acting opposite the Hoff in TERROR AT LONDON BRIDGE/ BRIDGE ACROSS TIME and - of course - THE FOG), spawned a whole industry of not-very-faithful-to-the-comics screen tie-ins. 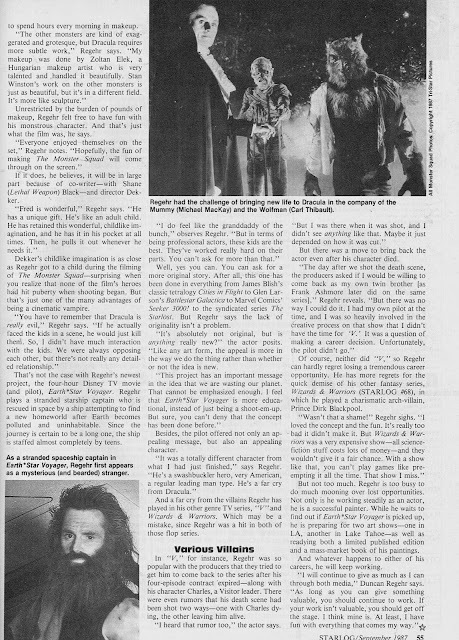 The Swamp Thing industry spawned a Craven-less sequel, a TV show (apparently spawned because the movies had been a bankable hit on cable... and Universal had a new studio attraction in Florida which needed some shows to fill the stages and keep the staff busy) and even an animated series/ excuse for a Kenner toyline which boasted a really annoying theme tune. 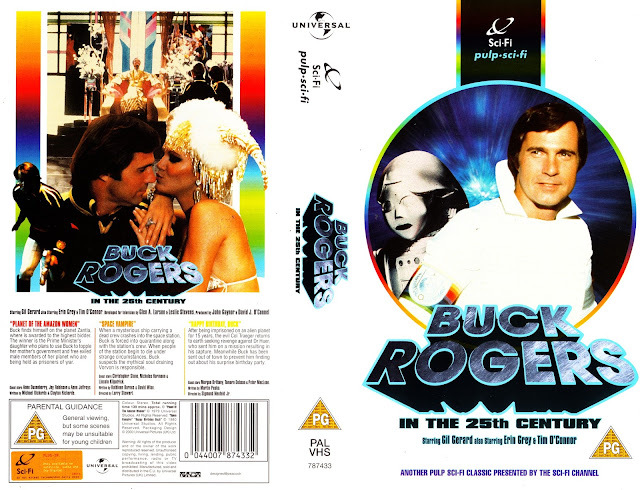 From the dying days of the VHS era: a stand-alone BUCK ROGERS IN THE 25TH CENTURY tape, released as part of a series of similarly-branded tapes as a tie-in between Universal Playback and the Sci-Fi Channel (when they used to show SF). The three episodes on this better-value-than-usual (CIC and the BBC tended to just bung two episodes of a drama on a tape... this label gave us three!) release were the not-as-good-as-it-sounds PLANET OF THE AMAZON WOMEN (Buck ventures into Carry On territory, giving Gerard a chance to flash his chest hairs for a bevvy on man-hungry space babes); SPACE VAMPIRE (the legendary banned-by-the-BBC horror show... even through it had previously popped-up in a family viewing slot on ITV and was part of the Buck sticker album. This tape is only a 'PG' as well) and HAPPY BIRTHDAY BUCK (assassination-based silliness). 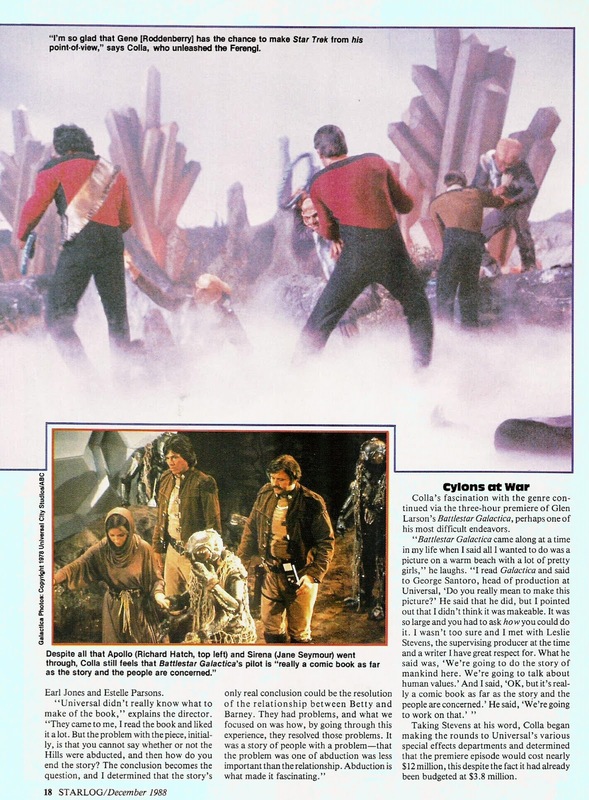 Predictably, the back cover stills are nothing to do with the selected episodes and actually feature a cut scene/ character from the original pilot episode. Draco appeared in some of the publicity material, was made into toys and generally looked like he was going to be a player... but was then all-but-cut from both the theatrical and TV prints. I'm currntly rewatching selected first season episodes in HD thanks to an imported Australian BR set... and really enjoying revisiting some episodes I've not seen in a while. They look great in High Def even if it does expose some sloppy production standards... and Gerard's almost ever-present stunt double. Sadly, except for some alternate cuts of a couple of the episodes, there is nothing in the way of new bonus features. Which is a pity. There is also a fan-made edit of the pilot (aka THE AWAKENING) which combines the theatrical and TV cuts into one longer piece. 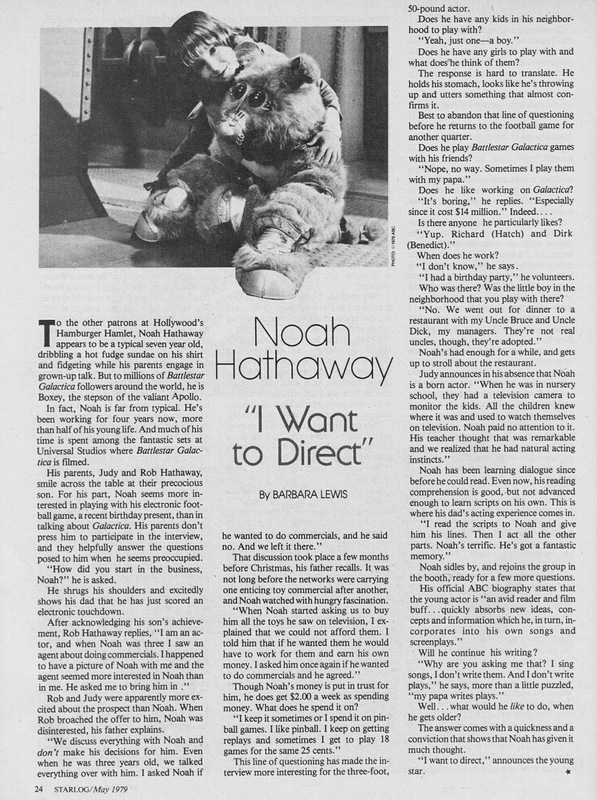 What it doesn't (can't) do is restore the scenes that never made it into either print. 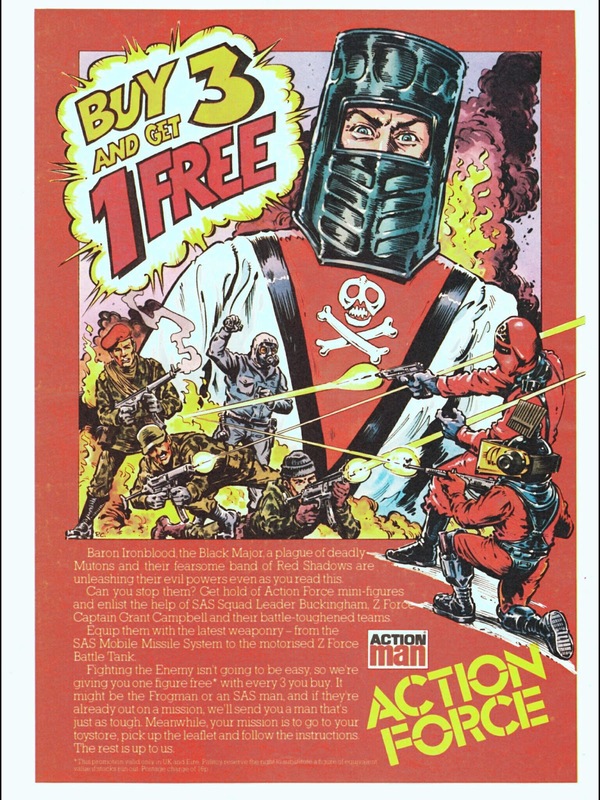 From July 1983: a Palitoy advert for the ACTION FORCE toyline, originally published in the EAGLE. 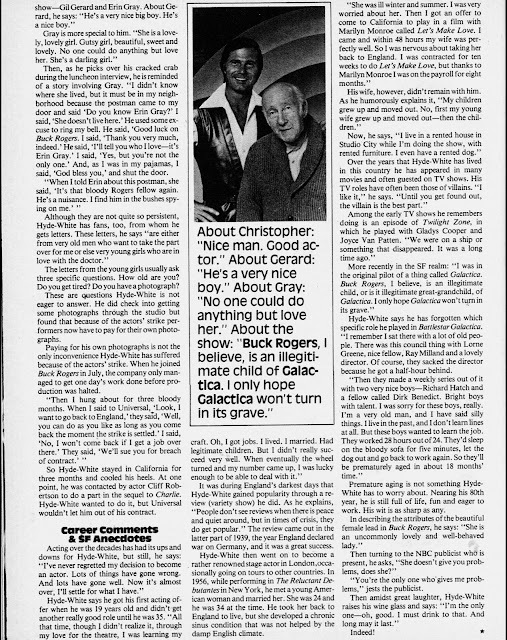 From January 1983: the origin of a species.... and a great dictator. 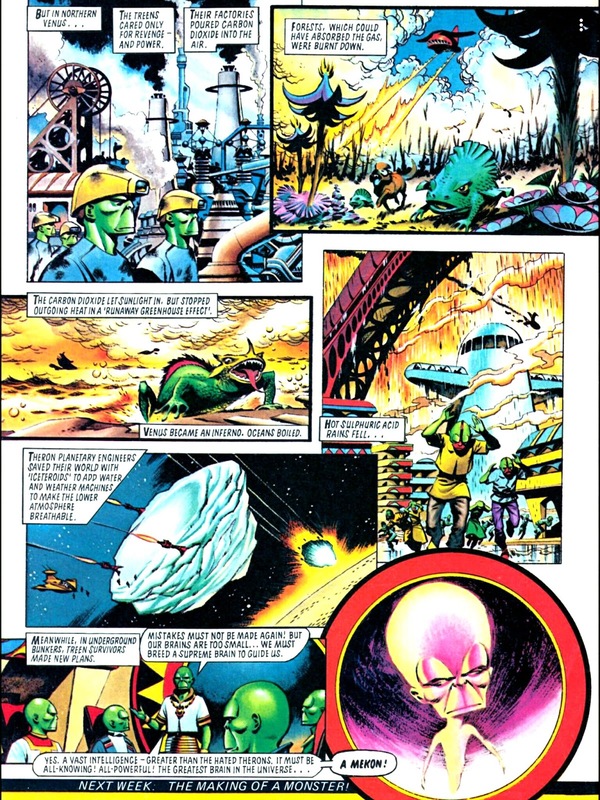 The second part of DAN DARE's look back at the origins of the Treens and their bulbous-headed overlord: the mighty Mekon. 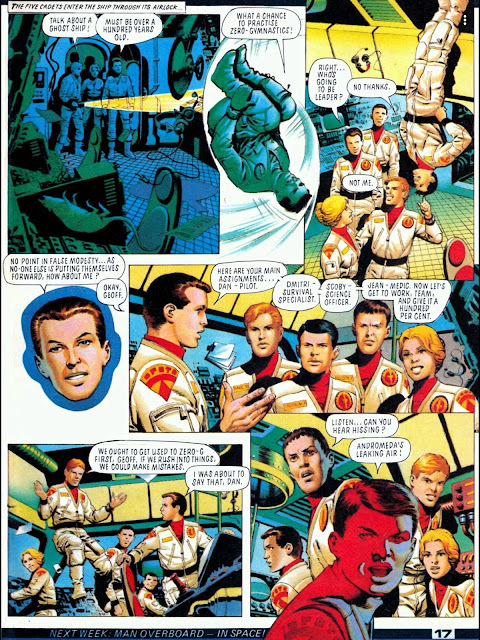 Once again, Ian Kennedy's art really pops off the page thanks to the superior print quality EAGLE enjoyed during 1982-83 before the newsprint reboot. I would be the first in line to buy a nicely put together compilation of this material. Although I bet the three-page format, including the centre-spread, would be a pagination nightmare to compile. From January 1983: an IPC in-house advert (published in the EAGLE) for another one of those clip-and-collect circulation-maintaining booklets so beloved of the Youth Group during this period. This time: BATTLE'S AIR ACES BOOKLET! 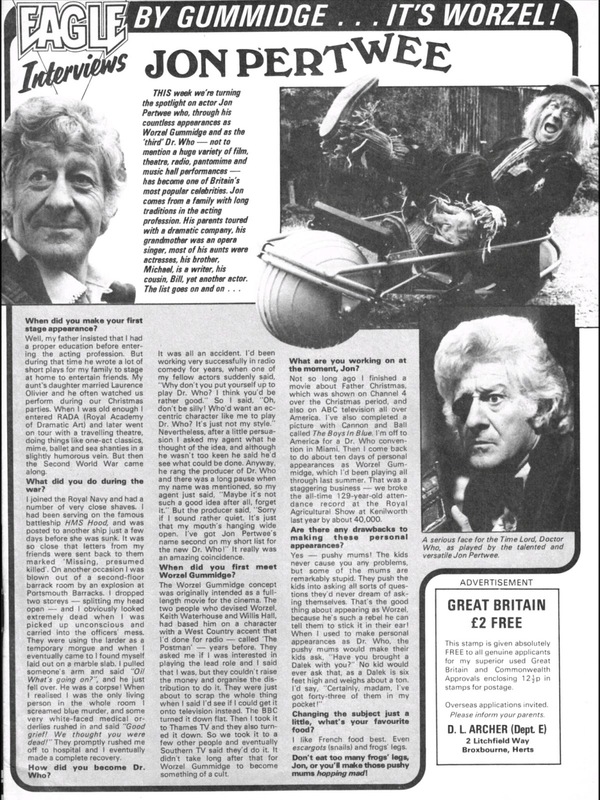 From January 1983: Jon Pertwee talks WORZEL GUMMIDGE and DOCTOR WHO with the (new) EAGLE. 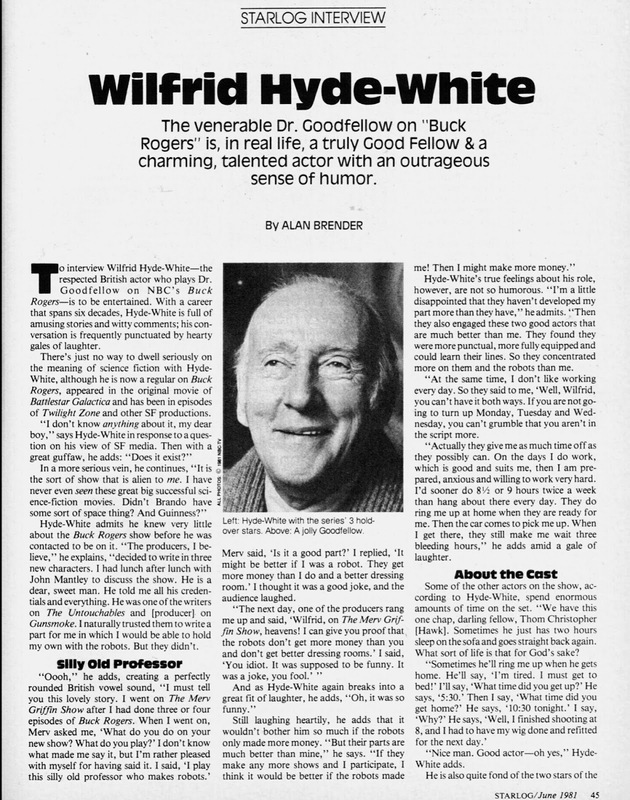 From 1981: New boy Wilfrid Hyde-White discusses life aboard the Searcher, during season two of BUCK ROGERS IN THE 25TH CENTURY, with STARLOG MAGAZINE. 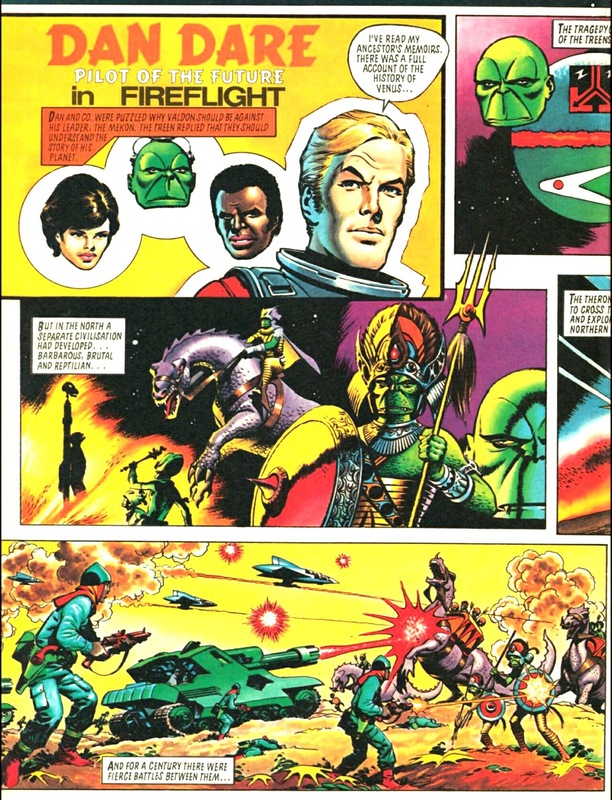 From January 1983: EAGLE issue 44 takes a brief break from the ongoing RETURN OF THE MEKON storyline (albeit now running under the Fireflight title) to recount the history of the Treens. Script by Pat Mills, amazing art by Ian Kennedy. The revived DAN DARE strip (featuring - for TV licensing reasons - the grandson of the original Pilot of the future) often played fast-and-loose with the continuity of the original strip so I have no idea if - and how - it fits together but readers in 1983 wouldn't have been much the wiser escept via the hazy memories of their own parents (the original Eagle, a shadow of its former self, shuttered in 1969) and the - rather nice - compilation books of the original strips published around this time. I've long maintained that the RETURN OF THE MEKON strip (along with the photostory era of DOOMLORD... which STARLOGGED has covered in the past) really needs to be reissued in a decent format. And I think these three pages demonstrate that. 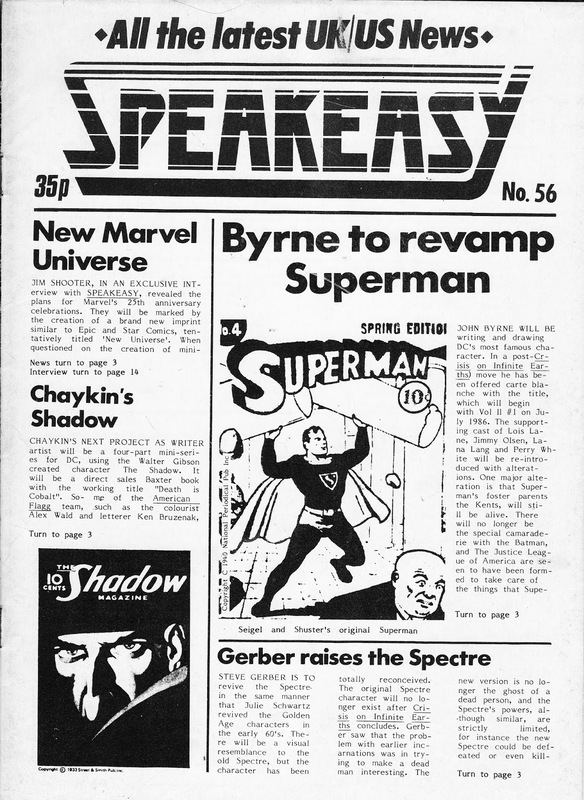 From November 1985: UK fanzine SPEAKEASY reports big changes at DC... and the launch of Marvel's ultimately ill-fated NEW UNIVERSE. From 1978: Another slice of bonkers US genre TV which - unless you are a KISS fan - has been largely forgotten today (and it is very possible that they - like the band - would like to forget it as well): KISS MEETS THE PHANTOM OF THE PARK, a US TV movie previewed in the pages of STARLOG MAGAZINE. I've seen this movie - as a bootleg - several times over the years and I still can't make any sense of it. 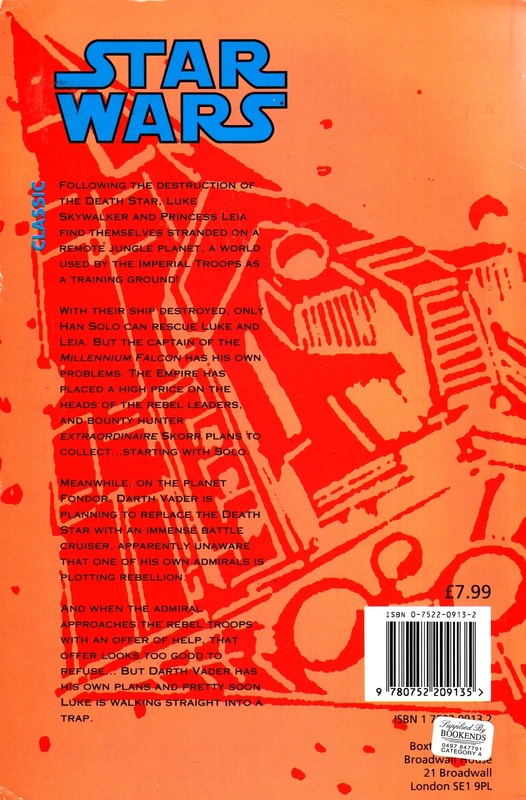 The plot - such as it is - is all over the place and involves a theme park (not, for once, the Universal backlot tour), superhuman rockers, a mad scientist and robot doubles. It's telling that the movie was a rare wander into the realm of live action for the folks at Hanna Barbera. The TV movie aired on US TV for Halloween 1978 and subsequently popped up in overseas theatres and on home video, sometimes under alternative titles and with alternative edits. 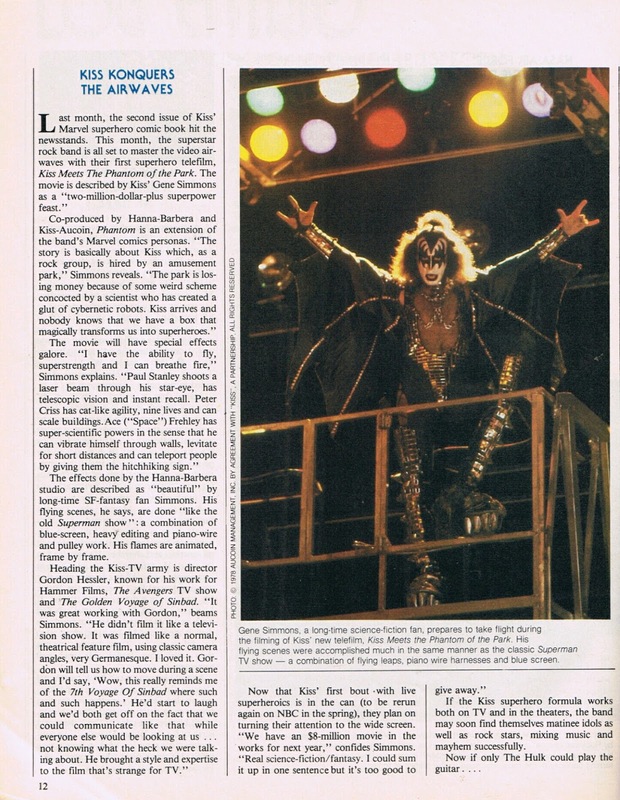 Years ago I spotted in a magazine, which I don't have, that there was some talk (and pre-production) of a KISS animated series.... but the project stalled for whatever reason. 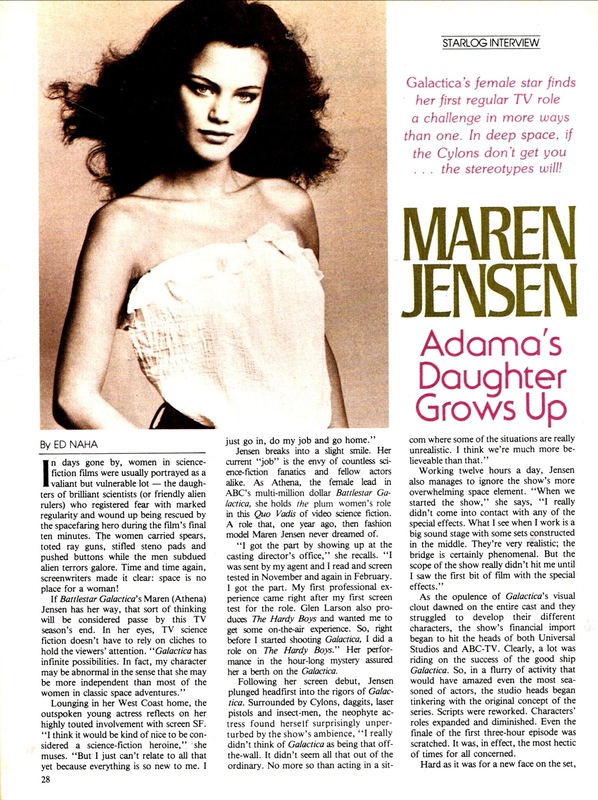 From 1978: BATTLESTAR GALACTICA beauty Maren Jensen talks to STARLOG MAGAZINE. Mareen's character, despite winning the show its second TV GUIDE cover, was slowly phased out over the single season, vanishing completely from the final few episodes... even when it would have made story sense for her to appear. Some sources have attributed this to her general lack of acting experience (although I've always found her performance on the show fine) whilst others have chalked it up to the overall trend of simplifying the show from mid-season onwards. Either way, it's a shame that she didn't stick with the show... and that the show didn't run longer in its original form.